Game description: The arcade classic returns with Gauntlet: Seven Sorrows. The game improves upon the old title with a deeper fighting system and light RPG elements. Now you can choose from six heroes, each with their own fighting style, abilities, and backstory. 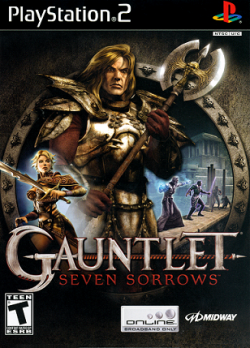 Gauntlet: Seven Sorrows has solo, cooperative, and online play modes. You can go online to join parties of fighters and trade goods. The follow-up to Gauntlet Legends and Gauntlet Dark Legacy. skip draw =1, Works very well. Even tried 3 player mode and fps din't drop too much., Skip draw =1 is advised to be used otherwise the game runs really slow in GSdx HW mode and causes VRAM issues. Software mode is alright. The PAL version of this game supports multiple languages through the BIOS configuration. Implementation requires Full boot - "Boot CDVD (full)". This page was last edited on 19 January 2018, at 21:28.